During 2010’s generally misguided ‘Racing for Change’ initiative, the brilliant and unique John McCririck stumbled upon a catchphrase. At the end of his betting-sage segment, he would sidle up to the camera with eyes pumping like a juiced up Ben Johnson, jab out a bejewelled finger and, with a bloodcurdling scream, encourage us to “GO RACING!!!”. In a sweep of his cloak he was off into the ether. 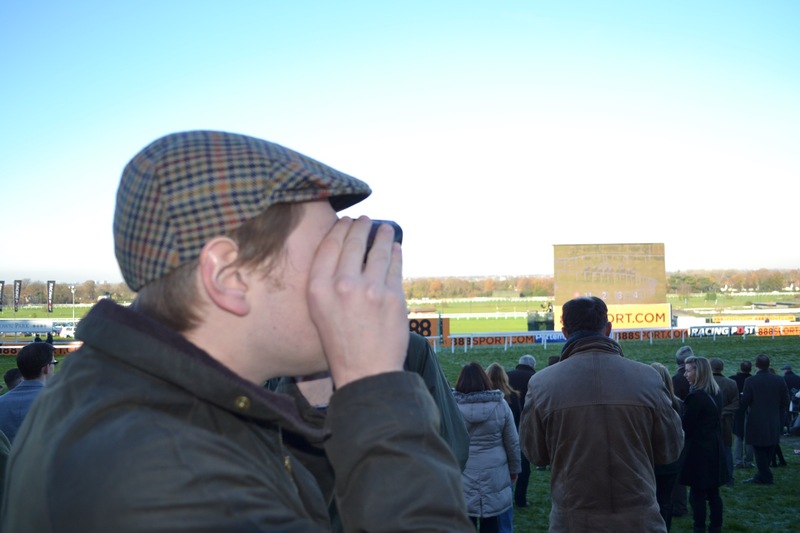 Go racing is what I have spent the last two pleasant weekends doing – delighting in all the drama, eccentricity, Guinness, and habits of old that National Hunt brings to the world. While the modern world may lampoon a great British character like McCririck, there are many like him at a jump racing meeting – though he is undoubtedly the leader of a marvellously mad bunch. My early season forays have been to the long standing Hennessy Gold Cup at Newbury and then, a week later, the ever interesting Tingle Creek at Sandown. Both distinguished meetings in their own right, but also notable markers in that ever important road that leads to Cheltenham. After a cold and wet week, I woke up on the 29th of November to a stupendously sunny England. The weather and the abundance of chaps deep in Movember gave the day an extra spring in its already bouncy step. When one potters off to Newbury the tonic of the morning is the 10.50 train from Paddington – for the regular Cheltenham goer this is like cold vodka for a Russian. The exit from the Newbury train station is equally pleasant; the ten yards perambulation to the course never over-exerts the giddy race goer. Newbury this year had such élan to it that one felt that Noel Coward was on the cusp of gently rolling out his Strasbourg piano with a song. The racing took a mirror to the tweed on the side; old fashioned and well worn. It was a day of heavy hoofed power and peerless ridding. My ever present nose to the ground smelt blood and money, unfortunately neither appeared for me. The 3 mile 2 furlong Hennessy Gold Cup itself is a race for the purists; the back breaking handicap and arduous ground attracts big powerful horses, with the more elegant three milers waiting until the flatter King George at Kempton. Not to say it doesn’t attract excellent horses – the teutonic Denman, the magnificent Arkle, and the gutsy Bobs Worth all superb winners. The big race produced a handicapper’s dream finish; three horses going at full tilt, all with a sporting shout. Many Clouds eventually battled hard up the hill, not backed by me, provoking emotional scenes for the unprolific Oliver Sherwood. The racing fraternity shared in delight for the small stable. Betting wise I washed my face for the whole day – bagging a couple of winners on AP McCoy…but it could have been better. I was with a sport’s journalist called James Emmett, who confessed to me that he has not won a bet on a horse race in two years (and not for the want of trying!). At my insistence we cobbled together our largest bet of the day on a horse called More of That, so far unbeaten and with the greatest jockey ever on board. We had to win, alas Mr Emmett’s woeful run continued when More of That dribbled into third place. James Emmett is the bookmakers friend and is greeted with a benevolent smile when he palms over his cash. A gentleman yes, but not a man one should ever take a tip from. Newbury should be very happy with the day. There was a lovely feel to it with a high proportion of the knowledgeable crowd appearing to be ‘racing people’ – hip flasks of all concoctions being slugged at from under a vast array of apt hats. A Cheltenhamesque train journey back to London was enjoyed with a few drams and an eloquent Irish race-goer who took minor umbridge at my contempt for Irish form. He was keen to show us otherwise, effusively tipping Tullow Tank for the next day at Punchestown. Mr Emmett gleefully followed his advice and again Irish form failed to shine. A week after Newbury I went to Sandown, a racecourse I was yet to have the pleasure of visiting. If Newbury was soaked in surprising sun, Sandown took delight in showcasing all of Jack Frost’s unheralded skills. If Newbury was one of those classic race days full of seasoned scampers, Sandown’s rhythm was more festive and family orientated (punctuated with groups of lager swilling barrow boys at the bar). A bitingly cold day, I sucked on my hip flask like an infant on a bottle of milk and plotted my way through a host of losses. My only return coming once again on a mount of the champ, AP Mccoy, upon the deliciously named Snake Eyes. This gave me enough cash to spend on the veteran Somersby in the big race in the Tingle Creek chase. With the ground unusually heavy, the day was littered with outsiders overturning the odds. Somersby, at 9-1, whetted my chops. Something else that moistened my lips was the shock discovery of winter Pimm’s. Having the normal human revulsion of mulled wine and seeing an ale cue longer than the one to enter Wimbledon, I turned to this new slightly saccharin delight. Winter Pimm’s reminded me of days of yonder, when my favourite drink in the world was hot ribena. The Tingle Creek is a 2 mile chase. It takes its name from the horse – a rather dazzling unbeaten American with three tremendous white socks who was popular favourite in the 1970s. The race has been expected to be a straight fight between former champions Sire de Grugy and the mighty Sprintre Sacre, but sadly both were injured. A vivacious cast was on show and after all a grade one chase is still a splendid show. Wily old Somersby led the charge but was nailed by Dodging Bullets, given an accomplished ride from Sam Twiston-Davis, over the last. My windfall taken, but my joy at a cracking race overtook it. Joy soon became a frozen tear with the news that Nicky Henderson’s crowd favourite Oscar Whisky was put down due to a broken leg. Racing bowed its head in shared sadness. On my way to the car my father and I came across Mr Henderson returning from the stricken horse. I am a big Henderson fan and have long dreamed of 30 seconds with the bon homme. I looked him in his eyes ready to shower my praises, however I realised there were tears in his eyes as he had just lost a horse that he obviously cared for. A nod of respect and a smile was sufficient intrusion into his private grief. This incident showed why we must follow McCrirck’s ramblings and “go racing” – a sport that has an encompassing boundary and once you are in you will want to stay with all the fine characters that fill the rich racing tapestry. Have a drink while you lose lots of money chasing lost causes! Unfortunately I must wait ’till Kempton in two weeks for my next fix of jump racing’s thrilling equine opera.